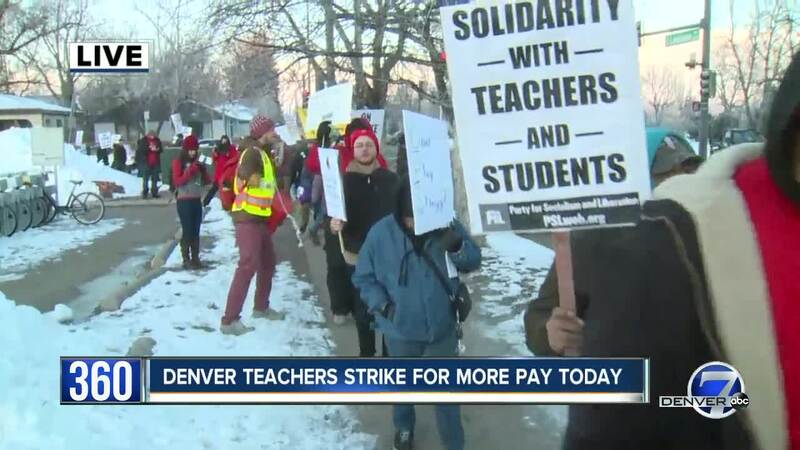 DENVER — After more than 15 months of failed negotiations over compensation, about 2,100 Denver Public Schools teachers will be absent Monday as they strike. We will post live updates on the strike to this blog. Tuesday, Feb. 12: We have a new blog going for Day 2 of the strike as negotiations between DPS and DCTA continue. 9:02 p.m. — All DPS schools will be open Tuesday as both sides resume contract negotiations. 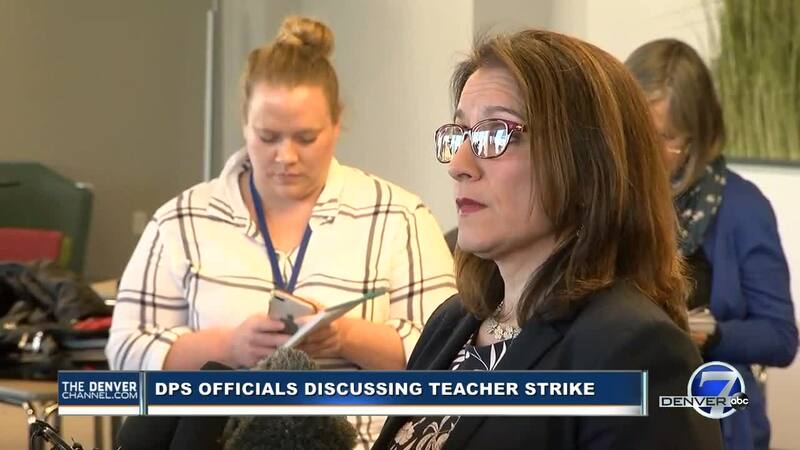 In a message to parents, DPS Superintendent Susana Cordova wrote, "We’re also doing everything we can to make sure the strike is over as soon as possible. We will be returning to the negotiating table tomorrow morning at 10, and I’m very eager to get back to work on reaching an agreement." 4:04 p.m. — Hundreds of teachers and their supporters rallied at the state Capitol Monday afternoon, with teachers union representatives and other education leaders urging Denver Public Schools to accept the union's offer lest the strike continue. Watch the full rally in the player below. The district and union plan to head back to the negotiating table on Tuesday at 10 a.m., both sides said. The suit argues that federal law requires public school districts to require special services to disabled children, and that the strike “did not publicly offer any plan for how it would serve disabled children while teachers were striking.” It also argues that the district hasn’t offered up a plan to make up for the services. “While this strike is going on, where is DPS going to find hundreds of special education teachers and service providers who are going to be able to assist kids who have very serious difficulties? … The vast majority of substitute teachers are not properly trained to help these kids,” Raykin said in a statement. The lawsuit was filed in U.S. District Court of Colorado and claims to seek to protect in excess of 10,000 DPS students with disabilities. 2:46 p.m. — Two Denver mothers with kids in early childhood education spoke to Denver7 about the effect those programs being closed during the strike have had on them. Laura Davis has a 5-year-old son in an EC-4 program at Stedman Elementary. Her job allows her to work from home if necessary, and said she felt fortunate to be able to do so compared to other parents in similar circumstances with their kids. But Davis’ son, Colby, said he would have rather been in school. “Today he was saying, ‘I want to play with my friends, I want to be with my friends.’ And I can tell you being with his friends and being with his teachers is a lot more fun than being home with me while I’m working on the computer,” Davis said. Molly Brown has three kids in DPS schools, including 4-year-old Francee. She said her older children went to class Monday to “see what school was going to be like” and didn’t want to fall behind. And she works at a church that allows her to bring her youngest daughter to work. But she says she supports the teachers and believes they deserve the better pay they have been fighting for. But she also says that things like TABOR and school funding formulas should be addressed. And after Monday, she said she would be reconsidering whether to send her older children to school on Tuesday. “I need them to come home this afternoon and see where we were with the day,” she said. 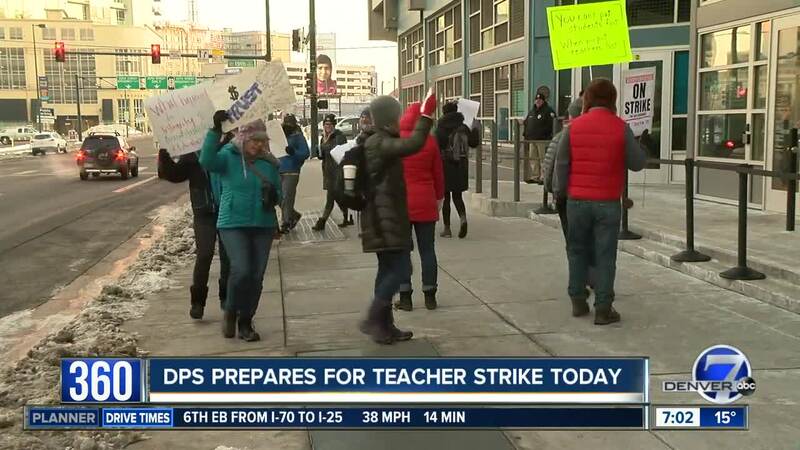 2 p.m. — Denver Public Schools said Monday afternoon that approximately 2,631 teachers called in to school Monday for the strike. But the DCTA says that a total of 3,769 teachers and special service providers picketed Monday morning. "More educators likely stayed out of school but were unable to come to participate in a picket due to childcare needs, working a second job or other personal circumstances," spokesman Mike Wetzel said. The DCTA and other education leaders are holding a rally for the teachers at the state Capitol at 2 p.m.
12:05 p.m. — Denver Public Schools Superintendent Susana Cordova said at an 11:30 a.m. news conference Monday that she saw “a real range of things” while she toured various schools on the first day of the teacher strike. She said she saw some classrooms and schools that were “very calm, very quiet, very orderly” but acknowledged some of them had few students left – particularly at East High School, where many students walked out of school Monday in support of their teachers. She said it was “not a normal day” in Denver schools but said there were no classrooms where students were unsafe or had a lack of supervision. 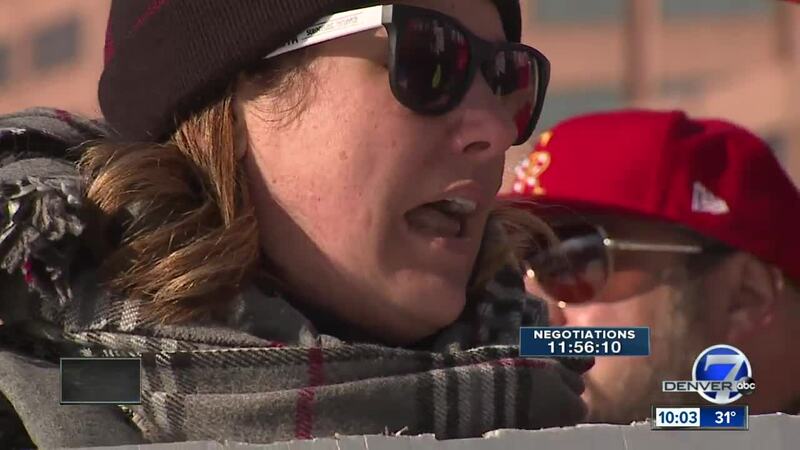 She said that the district and union had agreed to go back to the negotiating table on Tuesday starting at 10 a.m. and maintained that the two sides were closer to an agreement than they have been since negotiations started. But Cordova also maintained that the ball was in the union’s court to meet the district. “DPS is way past the middle in terms of what we’ve offered at this point,” she said, adding that she believed the district had worked as hard as it could to scrub money out of the district’s central office. “It is a problem for kids not to have their teachers in class, and so I want to get this done now,” she said. 11:20 a.m. — We expect to hear from Denver Public Schools officials at 11:30 a.m. for updates on the first day of the strike. Watch live in the player embedded below or by clicking here. 11:10 a.m. — A total of 2,169 teachers called out sick on Monday as of 11 a.m., according to DPS spokesman Will Jones. That would be about half of the 4,329 teachers in the district, according to its website. The district is supposed to provide more information about the staffing levels at an 11:30 a.m. news conference, which Denver7 plans to stream live. There are approximately 5,000 pre-school children not in early childhood care Monday because the district did not have the staffing to keep those classes open. House Majority Leader Alec Garnett, D-Denver, told the Associated Press that he believes the sides are “super close” to a deal and said that districts have to do a better job of putting their dollars toward classrooms and not administration. 10:50 a.m. — We are hearing from a few students across the district, many of whom are supporting the teachers, as well as some politicians from Colorado and across the country. "I think the people who are genuinely educated as to what's going on definitely causes a lot of support and respect toward these teachers and the amount of effort that they put in," said East High School student Cali Sherer. Congressman Jason Crow, D-Aurora, tweeted his support to the teachers despite not representing Denver: "Proud to stand in solidarity with Colorado teachers. Our teachers do so much for our kids and community. They deserve to be paid a fair wage and afford to live where they work. Let's give our kids & teachers the schools they deserve. Sen. Bernie Sanders, I-Vt., also tweeted his support for Denver teachers. 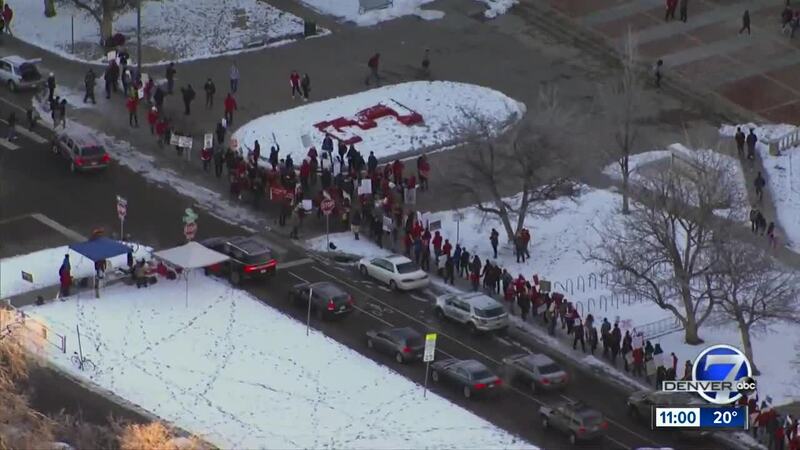 “I stand with the Denver teachers. Public education is fundamental to any functioning democratic society, and teaching is one of its most valuable and indispensable professions. We need to treat educators with respect and dignity. 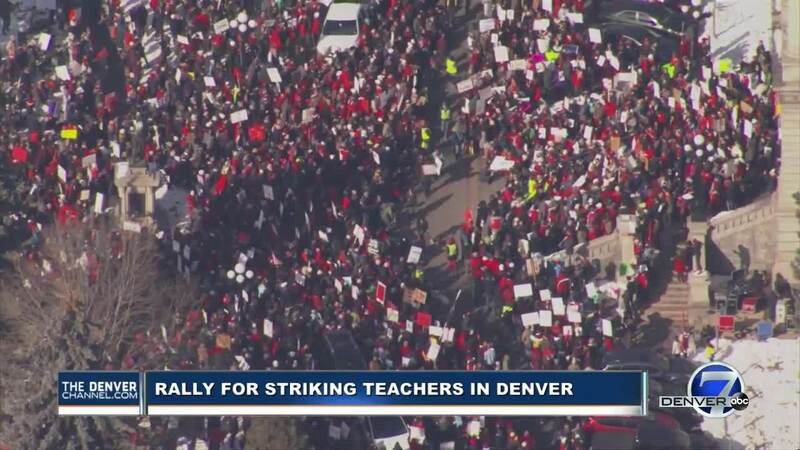 #DenverTeacherStrike,” he wrote. 10:44 a.m. — Video from students at East High School shows kids leaving their classes and filling the hallway this morning as teachers across the district went on strike. 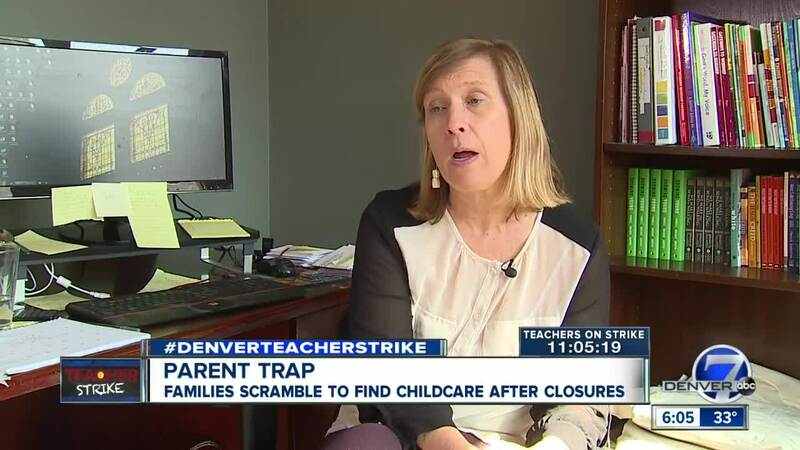 10:41 a.m. — A few parents of kids in early childhood education emailed with Denver7 about their situations trying to handle childcare with no early childhood classes taking place during the strike. “I work for a federal office and of course we just got back in a couple weeks ago. 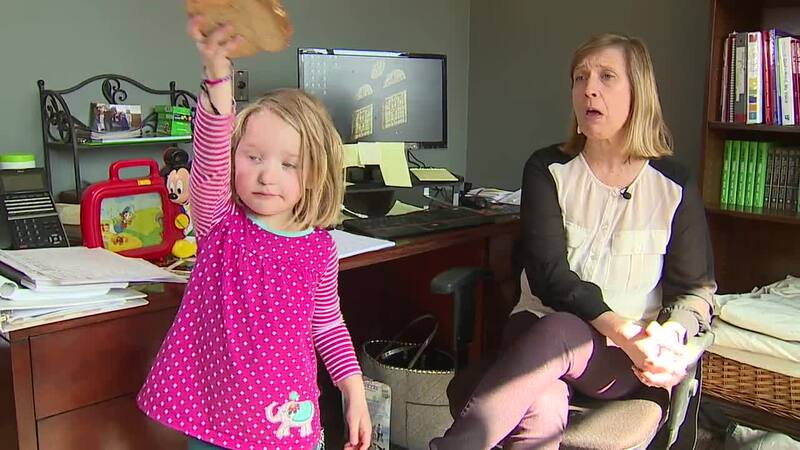 I am under a contracting company and was able to work at home and get paid, so I was not badly impacted,” said Casey Muirhead, a federal employee from the metro area with a 4-year-old son. Muirhead said there is a daycare spot available at her daughter’s daycare facility but she worried about those who didn’t have such options or have family nearby. “They could have given us weeks rather than days to come up with a plan,” she offered. 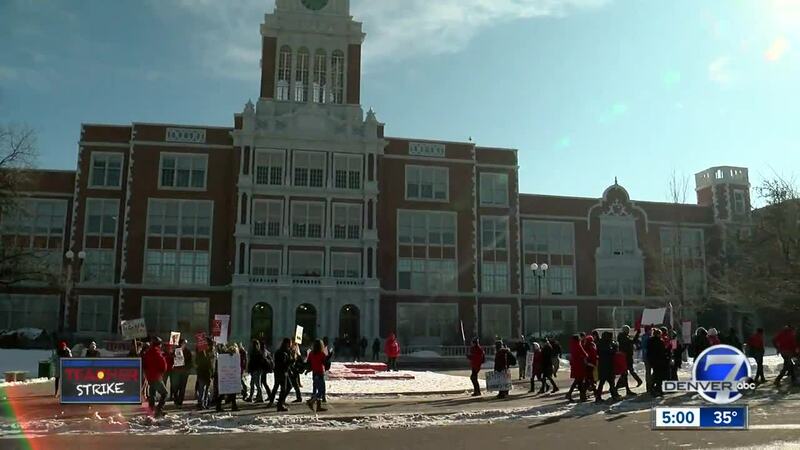 9:20 a.m. — Teachers started to march from West High School toward Speer and Colfax. 8:03 a.m. — A large group of students at South High School walked out of classrooms to show support for the teachers on strike. Many of them joined to picket. 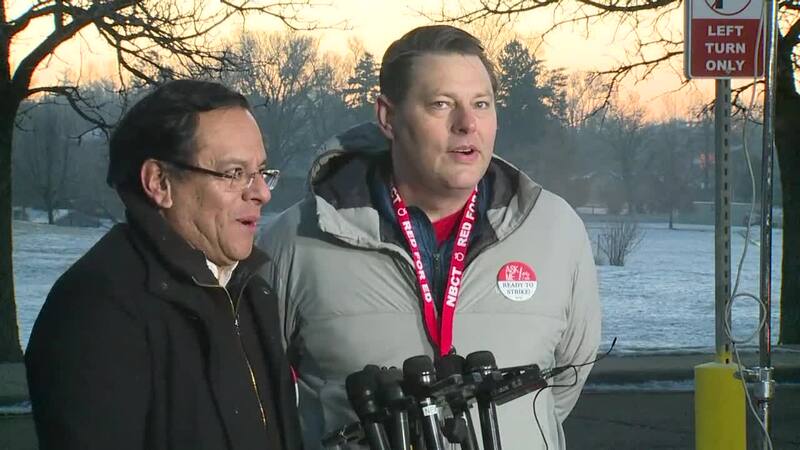 6:40 a.m. — Two members of Denver Classroom Teachers Association (DCTA) — Chief Spokesperson and Lead Negotiator Rob Gould and President Henry Roman — met with media Monday morning to answer questions about the DPS teacher strike, which officially starts at 7 a.m. The men said DPS had given the teachers permission to strike on the South High School property, but took it back last-minute. DPS has a budget of more than $1 billion and the DCTA is asking for a fraction of a percentage to close the gap for negotiations, Roman said. He said both sides will use this this time as a cooling period to gather their thoughts for the next meeting, which is scheduled for sometime Tuesday. The time has not been announced yet.